Negligence, excessive speeding and disregard for road traffic regulations on the part of drivers have been identified as the major causes of road crashes in Ghana. A preliminary investigation conducted by the National Road Safety Commission (NRSC) on crashes in the first two months of the year 2018 revealed these multiple contributory factors. 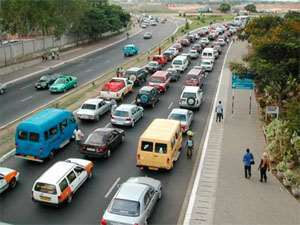 Mrs May Obiri Yeboah, the Executive Director of NRSC, at a press briefing in Accra on Tuesday, said its fact-finding research revealed that, among the contributory factors, were deficiencies associated with road infrastructure. 'The absence of road signs, roadway markings, street lighting and safe crossing facilities for pedestrians are issues that continue to find space in the list of crash contributory factors. 'I cannot talk about the road and crashes and not talk about the danger confronting motorists at road construction or work zones where contractors fail to install the appropriate traffic management and safety signs and expose motorists to open trenches and physical objects without any protection,' she added. Matching the records of the beginning of the years 2017 and 2018, the NRSC Director said the number of road traffic crashes, persons killed and persons injured have increased by 14.3per cent, 10.4 per cent and 28.7 per cent respectively. She said the task of ensuring safety on roads was a shared and collective responsibility and urged people to play their respective roles to keep the roads safe. The Executive Director said the NRSC, as the lead agency for road safety management in the country, was consistently at the forefront, carrying out education and sensitization programmes across the country and constantly engaging stakeholders at all levels, to take the necessary steps in their various endeavours to prevent road accidents. Mrs Obiri Yeboah reiterated that most of the crashes occurring on the roads could have been prevented if all road safety stakeholders and the parties involved had acted in compliance with existing safety procedures, standards and regulations. 'We cannot allow the continuous killing of innocent people on our roads. We must reverse the situation and the time is now, because we are all at risk. 'Let us remember that as a nation we have a task to respond to global demand for reducing road deaths and seriously injured by the year 2020, from our current annual average of 2,000 deaths and 6,000 seriously injured,' she said. Mrs Obiri Yeboah challenged all road safety stakeholders, especially Driver and Vehicle Licensing Authority and the Motor Traffic and Transport Department of the Ghana Police Service to step up actions to ensure that only competent drivers and vehicles enter the road space. 'Vehicle owners and drivers should not see this action as harassment but rather it is for our collective public good. Let's enforce the laws. It is time also for our road agencies, Ghana Highway Authority, Department of Urban Roads and Department of Feeder Roads to demonstrate utmost responsibility for safety by ensuring that our roads are adequately and properly signed, well-lit and devoid of dangerous potholes and physical objects. She called on the agencies to ensure that contractors working on roads install the appropriate traffic management and safety signs to protect trenches and other physical objects such as tips of sand and chippings.